In Italian, ‘brio’ means life, energy and enthusiasm, and there is no doubt that this villa captures that essence perfectly. 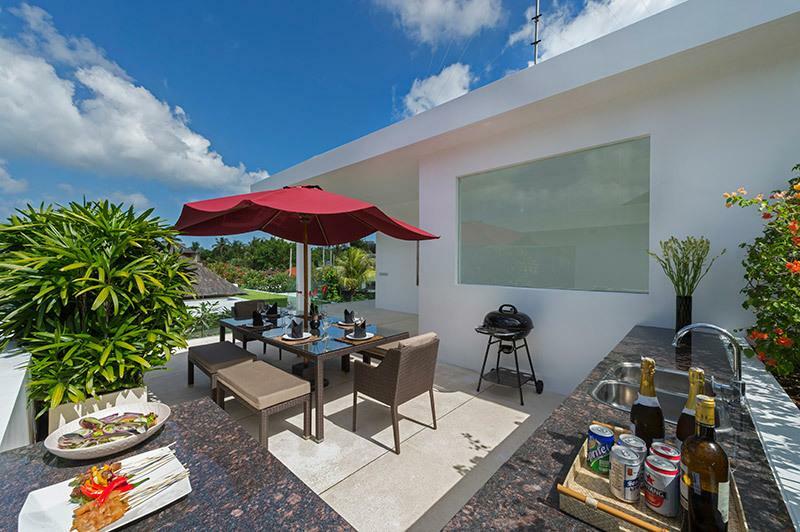 The villa is a wonderfully spacious and light-filled villa exuding contemporary elegance with its clean lines and tasteful neutral tones, and built using the best quality materials. 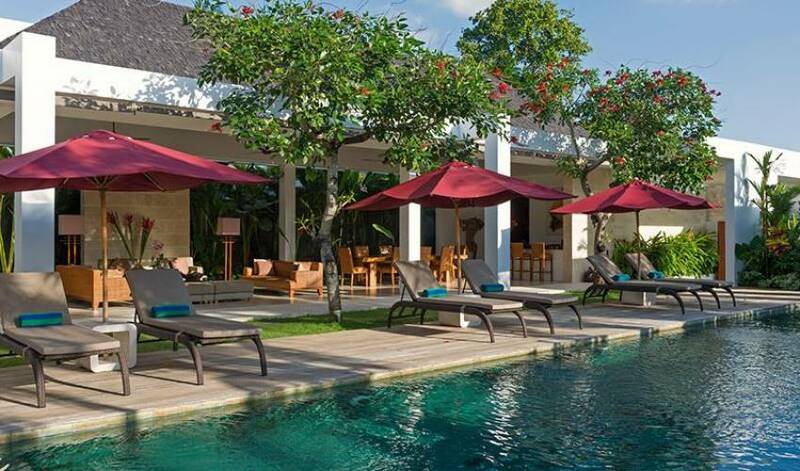 While Italian in style, the villa is truly Balinese in its essence. Set within a lush tropical garden resplendent with palm trees, frangipanis and orchids the villa has been designed to take advantage of its exotic location and offers bountiful spaces in which to luxuriate, be it poolside under a shady umbrella, on a comfy sofa in the open-sided lounge pavilion, or in the air-conditioned comfort of the villa’s entertainment room. The warm and friendly Balinese staff, with their bright smiles and professional attitude, will ensure that you want for nothing. 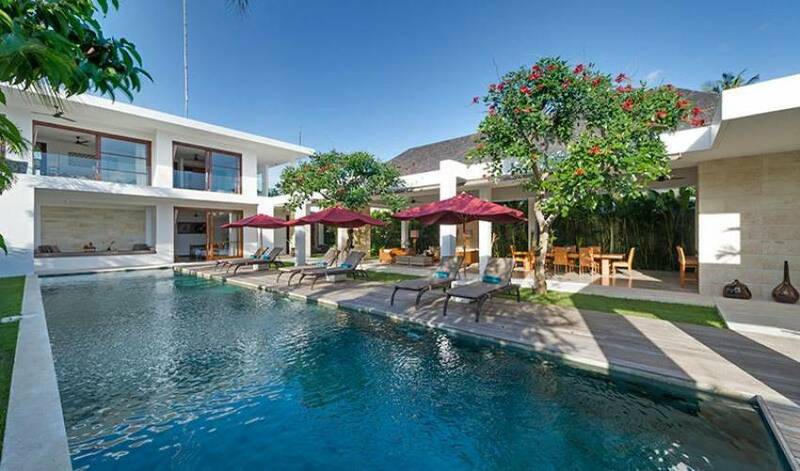 Your villa manager can book you a table at one of Seminyak’s world-class restaurants, or you can simply enjoy the services of the villa’s private cook, who will serve up gourmet cuisine using only the freshest ingredients in the privacy and comfort of your villa. 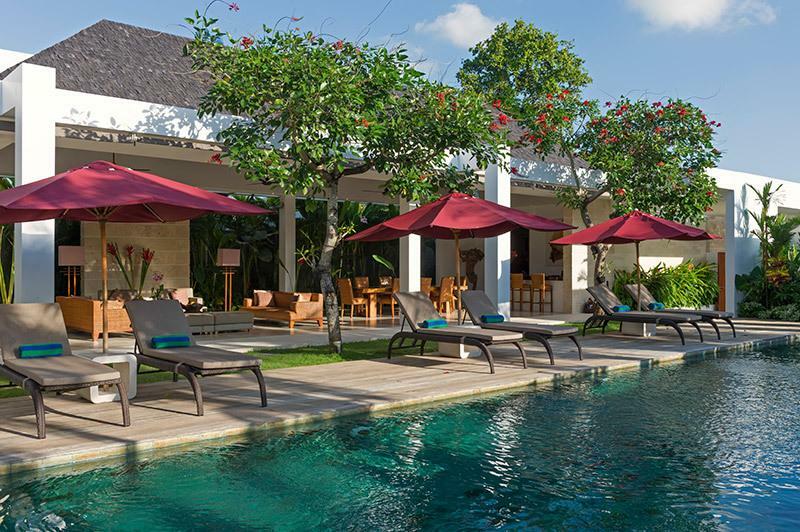 The villa is the perfect choice for families or groups of friends wanting to get together in tasteful surroundings; a place that’s ideally located to take advantage of everything that sophisticated Bali has to offer, or a place to simply relax and unwind. 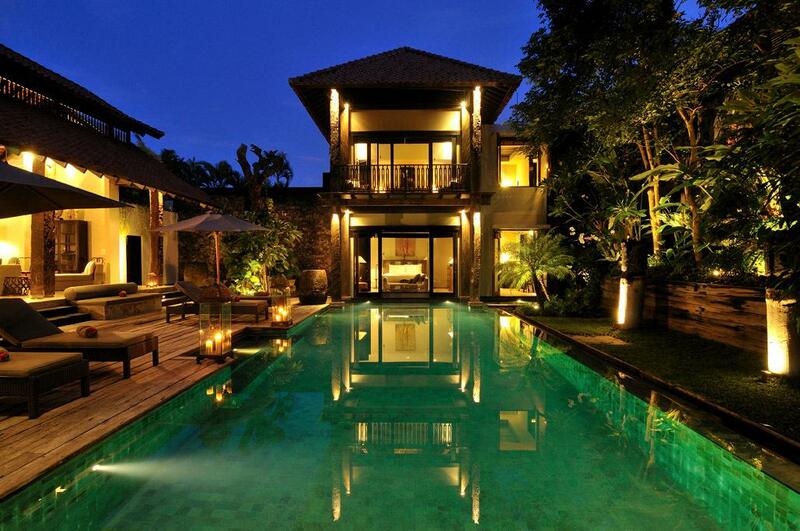 Within its tropical garden setting, the villa’s stunning 21-metre pool forms the villa’s centrepiece. Facing the pool and gardens are two pavilions, the first of which provides an enormous open-plan and open-sided dining, bar and lounge area as well as the villa’s well-equipped kitchen. 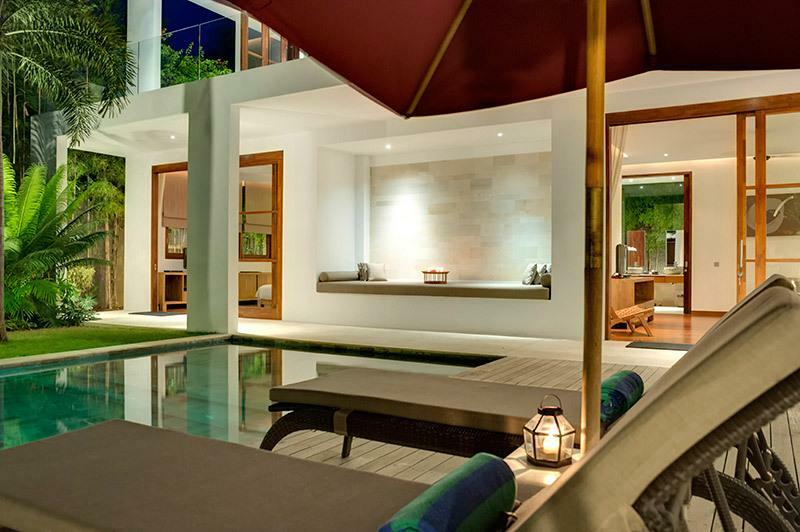 What makes the lounge and dining pavilion here so special is the wonderful interplay between indoor and outdoor space; unconfined by doors or windows, the balmy Balinese breezes flow through effortlessly. 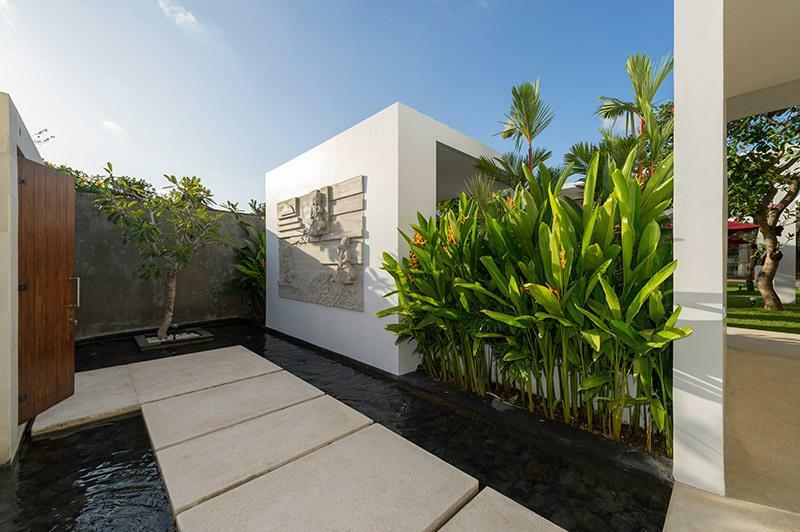 The marble-floored, open-plan lounge and dining area, which also features a bar with seating for three, is backed by a ‘wall’ of palms and luxuriant tropical plants and overlooks the garden and pool area. 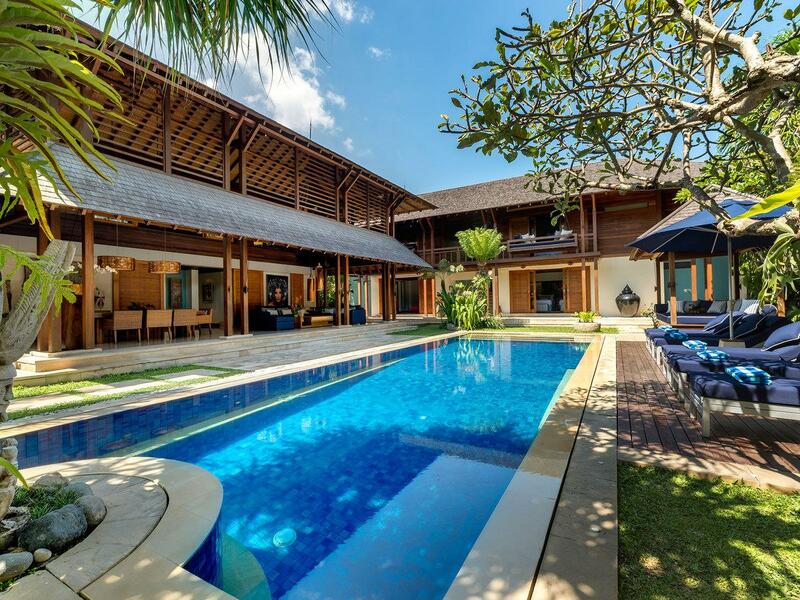 Settle down on the rattan sofas under the traditional pitched roof, lulled by the gentle whir of the ceiling fans, while you watch the poolside comings and goings. 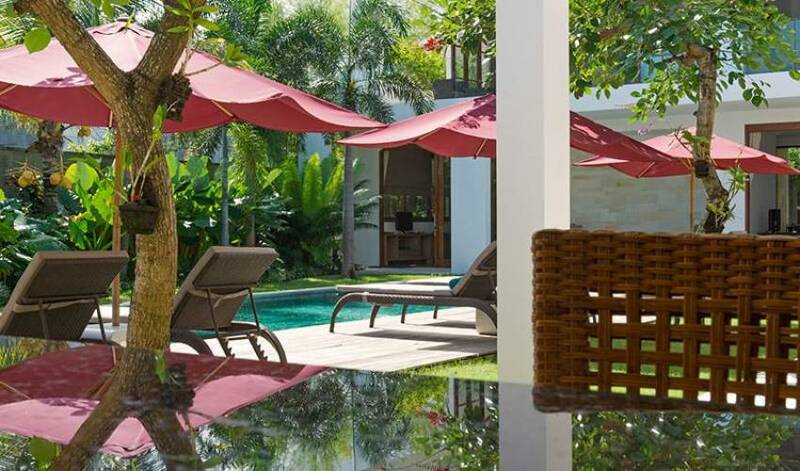 There is no shortage of outdoor relaxation space at the villa; from the delightfully spacious, cushioned gazebo at one end of the pool, to the six umbrella-shaded sun loungers on the wooden deck, to the cosy nook on the ground floor of the bedroom pavilion, that makes the perfect setting for an afternoon nap. 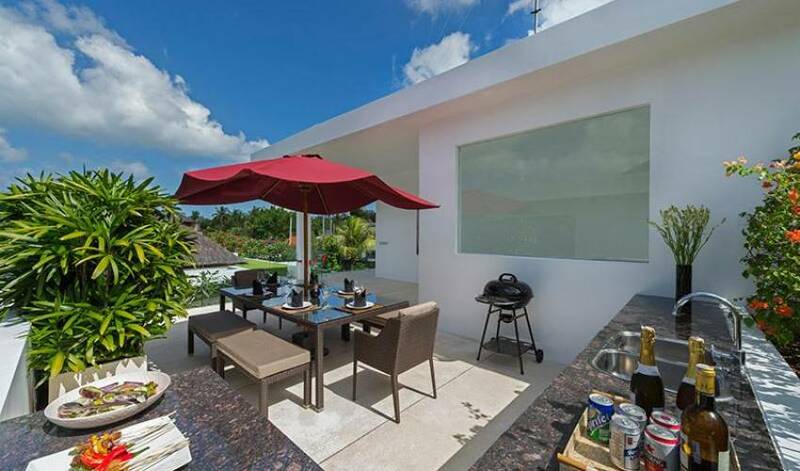 The poolside area is also a fabulous spot to hold an intimate garden party or a barbecue. 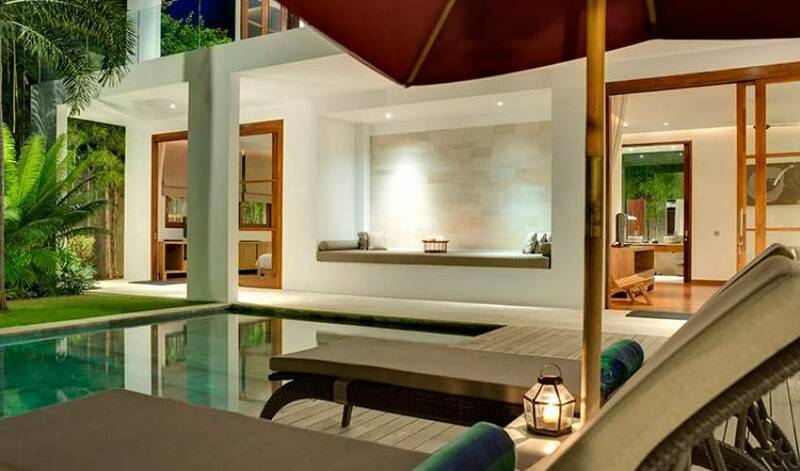 The villa has two spacious king-bedded master suites. 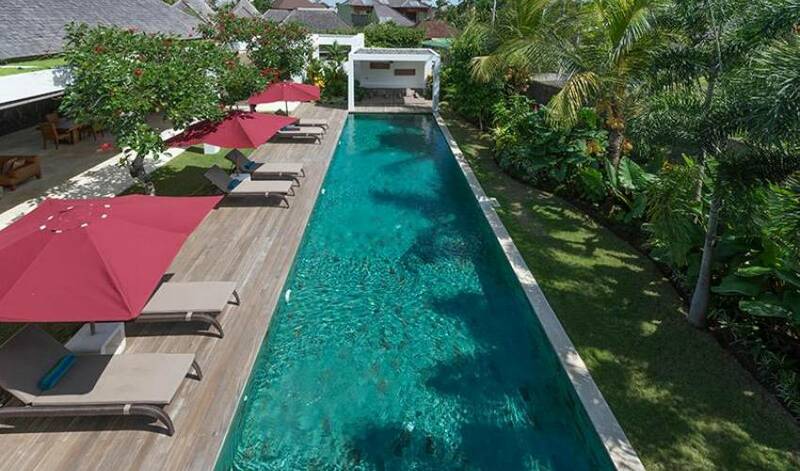 The light and airy ground floor master conveniently opens onto the garden and pool while the second floor suite has a covered balcony with charming views over the rooftops of Seminyak. Both master suites have a satellite television and DVD player and can be cooled by either air-conditioning or ceiling fans. Two large ensuite bathrooms feature elegant stone flooring, twin stone sinks, rain showers and bathtubs. 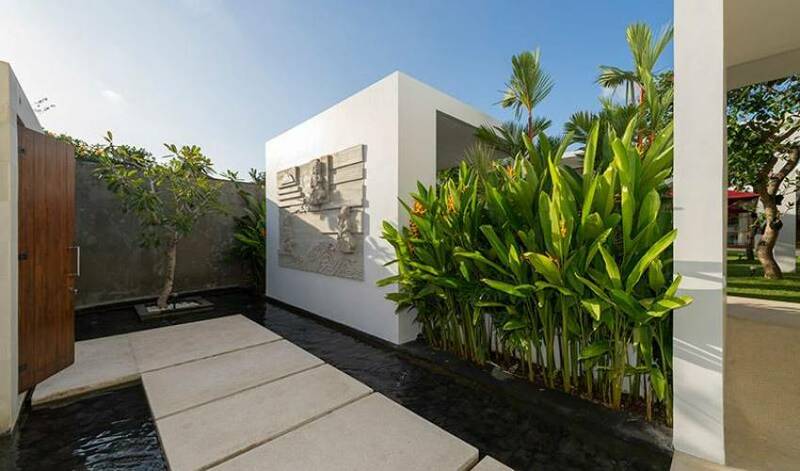 The ground floor bathroom boasts a stunning outdoor bathtub surrounded by tropical gardens. 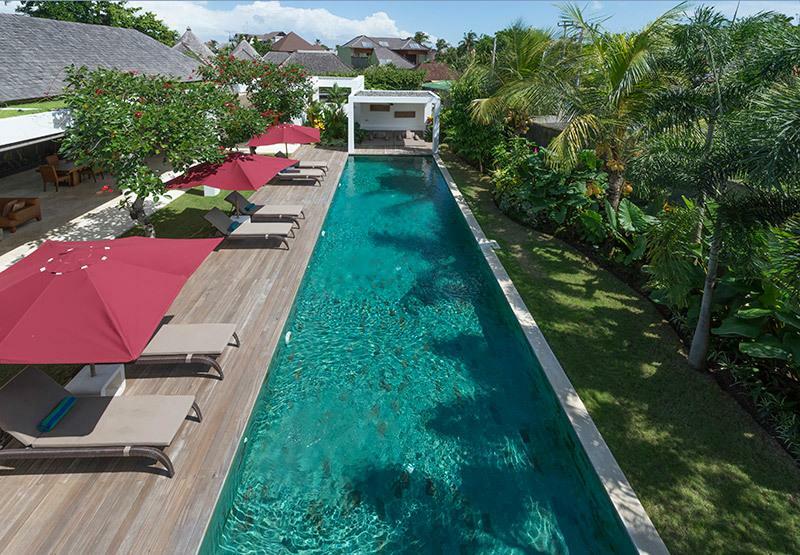 Ideally positioned to offer tropical tranquillity, beach fun and sophisticated shopping and dining choices, the villa’s location is every holidaymaker’s dream. 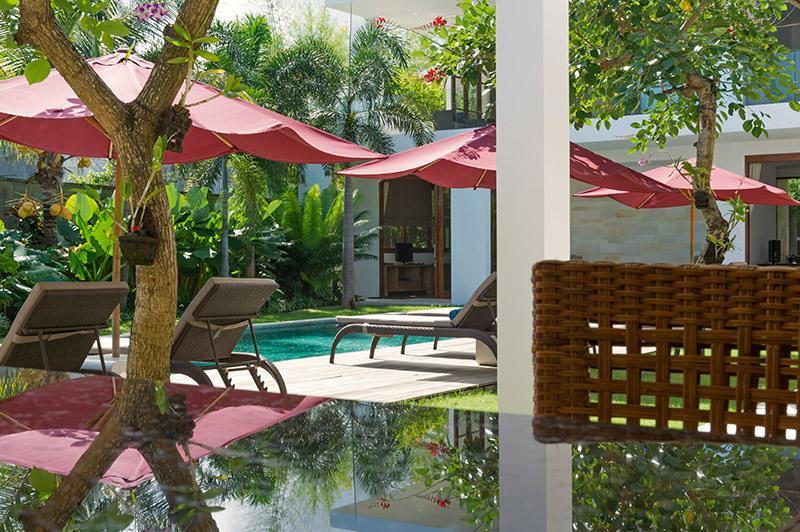 The villa is within walking distance of many of Bali’s iconic restaurants and bars, including Potato Head Beach Club, Ku de Ta, Sarong and Métis. Guests will delight in the variety of spas virtually on Casa Brio’s doorstep, and the abundance of fabulous boutiques offering everything from clothing to jewellery to home wares. 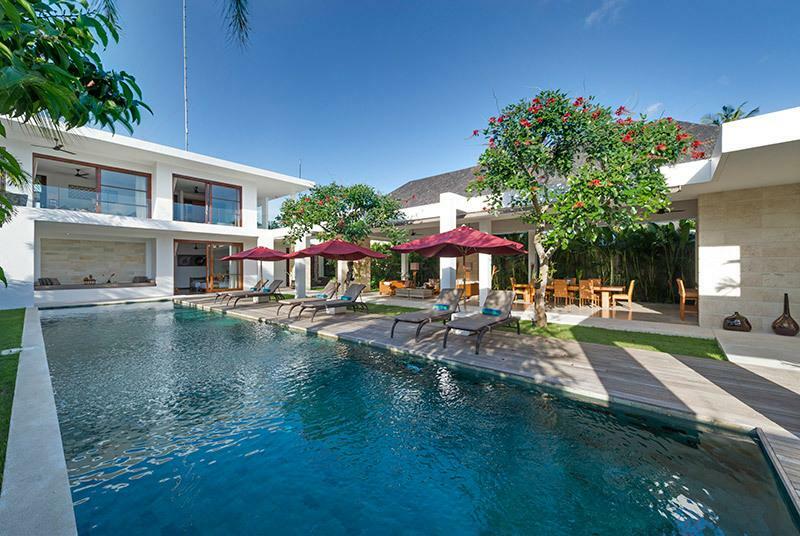 The ocean is just a five-minute walk away and surfers will love the breaks on nearby Canggu Beach. If that’s all too energetic then simply take a sunset stroll to one of the many beach bars and feel sand between your toes.